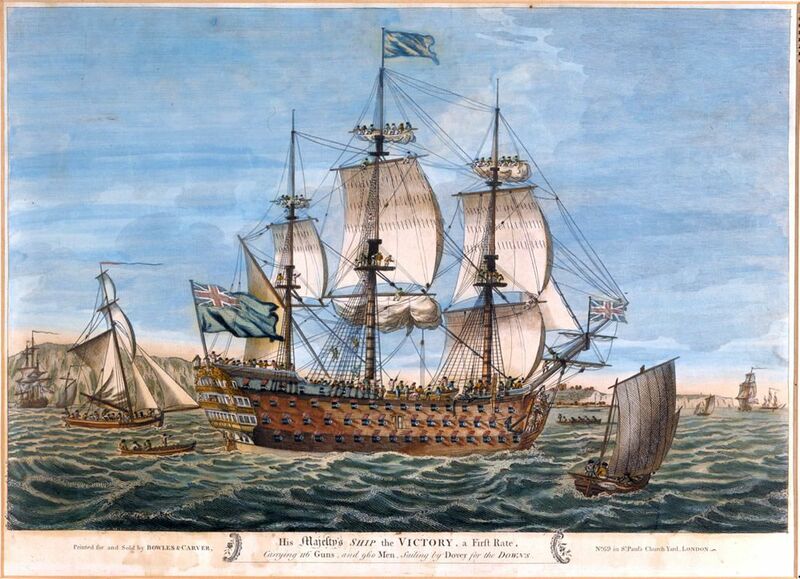 Colour engraving of HMS Victory (launched 1765) printed for and sold by Bowles & Carver, London. The ship is pictured flying a blue ensign from its stern, a union flag from the jackstaff and a plain blue flag from the mainmast. Sailors are shown on the deck and in the rigging. Seven small ships, varying in size from small warships to cutters, are pictured close by with the White Cliffs of Dover in background. This His Majestys Ship the Victory, a First Rate, Carrying 116 Guns and 960 Men, Sailing by Dover for the Downs Art Print is created using state of the art, industry leading Digital printers. The result - a stunning reproduction at an affordable price.